It’s time to pick up from last week’s discussion on Legacies (Legacies-for-rk-stones). This week we will talk about Legacies for RK bags. Some key common topics from last week include: how to spot a Major versus Minor legacy, setting your legacies on the LI between level 30 and 40, & the importance of having separate LIs for DPS and Healing. I won’t rehash that here. 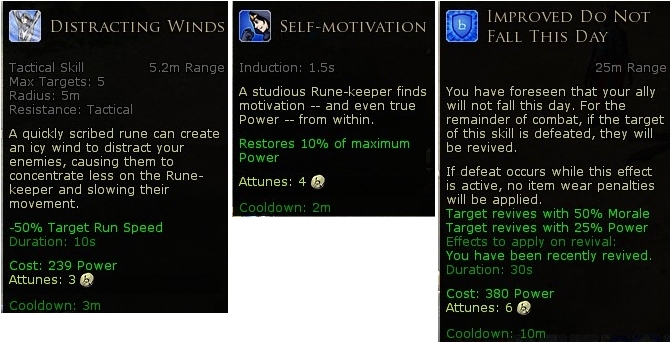 So, let’s jump into the Legacies for Rune-satchels. Here are the major legacies for RK bags, subdivided by type. There are 8 Major legacies. You will likely get to choose 3 of them for your RK bag. And… here are the Minor bag legacies. There are 8 of them; or you can slot a Stat legacy instead of those. Of the 17 choices: 5 are Healing, 4 are skill damage, 1 improves stun chance, 2 are frost skill cooldowns, 3 are middle path, 1 improves Shocking Touch, & then finally the always possible stat improvement. Let’s go through them and narrow these down to build a bag that maximizes DPS, then one for Healing. Healing (5): (Pulses Prelude to Hope, Writ of Health, Epic for the Ages Healing, Mending Verse Healing, Word of Exaltation CD) If your job is to maximize damage, no Healing legacies belong here. For the healing bag, probably take them all. Skill damage (4): (Scribe's Spark Damage, Essence of Flame Damage, Writ of Fire Damage, Ceaseless Argument Damage) Assuming you actually do use these skills (and why wouldn't you be? ), these are some clear choices for a DPS bag. 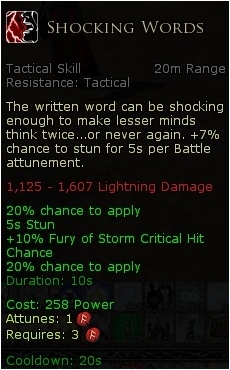 Shocking Words stun chance: Many bosses are immune to stun chance, but this legacy is still very useful against non-bosses (and creeps). I personally use Shocking Words at lot. Once the crits and improved stun chances start rolling, this skill spends most of the fight at around 83% stun chance and hitting for over 5k damage. 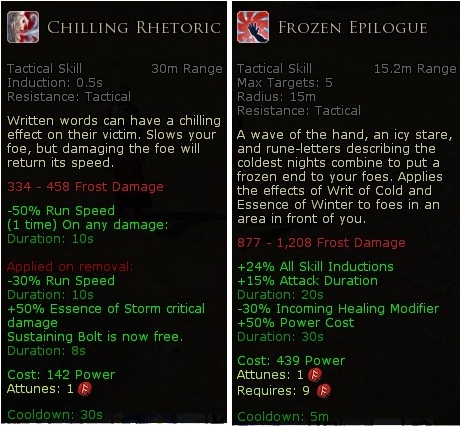 Frost CDs (2): (Chilling Rhetoric CD, Frozen Epilogue CD) A max’ed Chilling Rhetoric legacy would put the CD from 30s to 20s. The max Frozen Epilogue would move the CD from 5 minutes to 2 min 20 sec. These are good, but what did you give up to get these? Middle Path (3): (Distracting Winds CD, Do not fall this day CD, Self Motivation power return) All three are useful skills, but the gain versus loss… Distracting Winds CD 3 min to 2 min, Do not fall CD 10 mins to 8 min 20 sec. When are you in constant combat for 8 minutes? 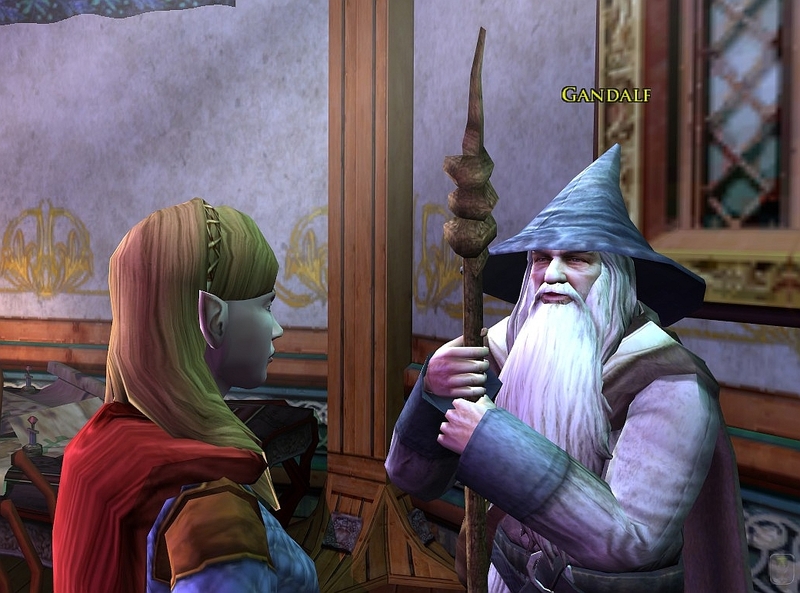 Mebbe Saruman? 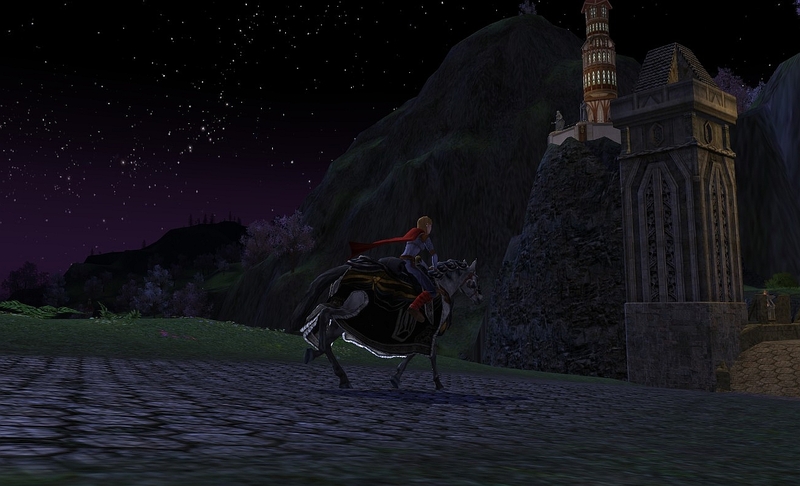 (Draigoch lasts a long time but there are constant combat interrupts that spoil this one). Self-motivation (which was recently changed in U6)… Normal: once every 2 minutes you restore 10% of max power. With this legacy maxed, it could gain that power back in 90s. So, for example, over the course of a 6 minute fight, I could gain an additional 820ish power. That is not nothing, but how often is power really an issue AND 820 power is the difference between life and death? Let’s prepare for maximum dps and then go fix the power issue by other means if that is a problem. 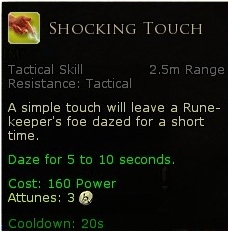 Shocking Touch: I used to use Shocking touch more. Only when I really need to stop a foe in his tracks do I use it now (moors). How often have I seen anything resist a shocking touch? Not often, so I am not certain how much this legacy to lower the target's resistance really helps. It isn't the difference of can you use Shocking Touch, your touch is just more effective. For a DPS bag, I am not going to take the Healing, the frost CDs are good but situational, and the middle path only inadvertently gives more DPS if something goes very wrong. The skill damage legacies are fairly easy choices. (1) Major: Scribe’s Spark is in constant use, followed by (2) Minor: Ceaseless Argument, (3) Major: Writ of Fire damage and (4) Major: Essence of Flame Damage. Fortunately, my bag has 4 Majors and 2 Minors (just luck on the Reforge). My other Major choice is (5) Major: Shocking Words stun chance. Actually, I would have dropped Essence of Flame to get Shocking Words, just because of the much greater frequency and functionality (for me at least) of its use. So, what about the 6th Legacy? I opted for a stat, Vitality (or could have gone with Will depending on how the rest of the build was designed). Chilling Rhetoric would have been good also if you use Chilling Rhetoric as often as its CD ends, and I have used Shocking Touch before. Any of the others just aren’t max DPS legacies. The RK healing bag is fun! First of all, as with the DPS stone’s Tactical Damage, you must maximize the Tactical Healing of the Healing Bag. 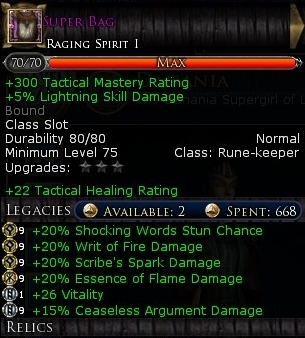 For this reason, you will want a 2nd Age bag if you can get it, and since the skirmish guy gives them away (see bottom of Legacies-for-rk-stones), you should be able to get this one. The Healing bag has easy choices. What helps healing? The five Healing Legacies: (1) Pulses Prelude to Hope, (2) Writ of Health, (3) Epic for the Ages Healing, (4) Mending Verse Healing, (5) Word of Exaltation CD. For the 6th Legacy, I chose a stat, Will. You will notice that there are not enough points to maximize Tactical Healing and all five of these legacies. 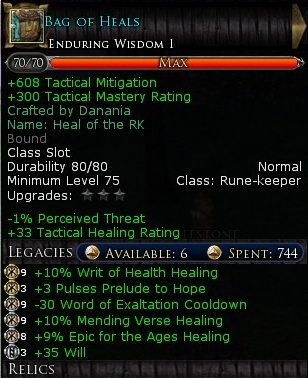 Which has the least value as a Healing legacy? I would vote that extra Pulses to Prelude of Hope has the least benefit. Prelude naturally lasts 30s; each additional pulse gives an extra 5s. Are you really not going to hit Prelude again within 30s? Of course, you will. It is a good part of the healing rotation. After you offer someone a Writ of Health, you follow up with a Prelude of Hope. It has no induction, is a nice heal with a HoT, AND the combination of Writ then Prelude gives power back to you and the target. It is a great skill, but meh for a legacy. Another stat might have been more useful. A little planning on Legacies goes a long way. As always, feel free to leave comments or questions! A swap bag is your best bet for the Do Not Fall This Day legacy. Combine the trait with the bag and you get a 5 minute 20 second cooldown on the skill, which means for most fights in Tower you can get it on two targets, and Saruman you can get it on ~4. Equip the bag, use the skill, switch back to your normal bag. I also have Self-Motivation on that swap bag, since the power return isn't affected by heal rating anymore. Self-motivation is a really nice skill once you have a rediculous amount of Will at end game... compared to your 820 power per 6 minute fight, I can return around that much per use. Cory, Nice work-around on the "swap bag" for the Do not fall this day! Even though it is the only in-combat rez RKs have, I still put too little value on its use to actually trait it when I could have traited with actual dps or hitting. But great to see another perspective! haha The first pic with Gandalf is nice indeed! Yay Elinnea! For me, it was a matter of just sitting down and dissecting what each legacy means, then making a plan before starting. During that plan period, I collected tons of IXP runes and legacy scrolls from breaking LIs at level 31. (Yes, you can get the legacy scroll at level 30, but level 31 gives better relic yield as it is part of the next tier ...break at 11, 21, 31, 41, 51, or max...). Yeah... Gandalf and I are tight! BFFs. He WILL let me pass. Where did you get the scroll adding Tact Mast and Mit? Hello Anonymous. I am pretty sure that LI title scroll comes from Bron in Galtrev. The quest is "The Defense of Galtrev". The scroll is called "Enduring Wisdom I".